1. Heat oven to 425 F. Meanwhile heat bacon in a medium sized skillet over medium heat. Make sure to fry the bacon until crispy. Once bacon is finished cooking, remove from skillet and transfer to paper towels to soak up the grease. 2. Let cool for 5 minutes. Chop onions, and set aside. Next break bacon up into pieces and place into a medium bowl. 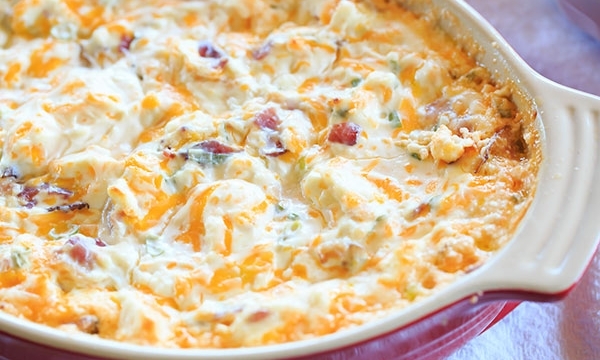 Combine sour cream, cheeses, and onions, mixing well. Transfer mixture into a 2-quart baking dish. Bake for 25 to 30 minutes.